There's an art to creating a truly great online store. Right off the bat, it has to look good and work flawlessly. It has to pack a lot of power while staying easy to use. It should look trustworthy and offer a variety of reliable payment options to make sure your customers are comfortable making a transaction. With Shopping Cart Creator Pro, your online store will pack all these features and a whole lot more. It comes with all the resources you need: five payment providers, powerful inventory tracking, and the same easy-to-use WYSIWYG functionality you've come to expect from us. All without tedious installs or complicated server configurations — there's nothing overwhelming or complex about it. We've made the effort to ensure that every window, every function, every option, and every button is clear and easy to use. Whether you're managing your store, editing products, setting up shipping, or adding a payment provider, Shopping Cart Creator Pro is supporting you with intuitive dialogs. And just look at all the features it packs! Get organized with subcategories, and give your store an added level of organization. Use custom price variations to charge different prices for variations of the same item. It's easy to keep track of your products with built-in inventory tracking, which puts a list of your transactions on a secure webpage right on your server. Plus, it keeps you from selling more items than you have! With weight-based shipping, you can set up different shipping prices for different weight ranges. Finally, if you've created a shop in another program and don't want to have to recreate everything from scratch, you're in luck! With Shopping Cart Creator Pro, you can easily import your data from a .csv file. Now compatible with PHP 5.x Removed links from payment merchant logos on the cart. Quick Start Guide is now online Implemented some fixes to the 2CO merchant scripts Implemented some fixes to the World Pay merchant scripts Removed Google Checkout Lots of other backend tweaks to scripts. shopping cart, shopping cart software, shopping carts, ecommerce software, ecommerce solution, php shopping cart Design a customized online store with CoffeeCup Shopping Cart Creator Pro and take your business online. 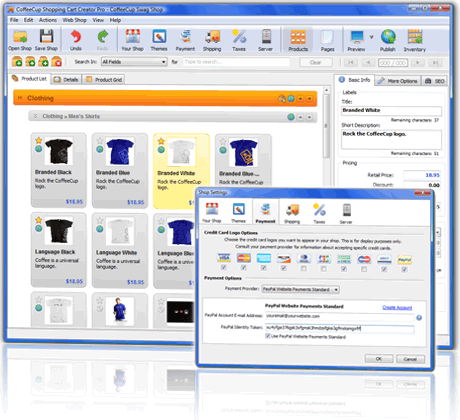 Add products and customize 5 additional webpages. All aspects of pricing, shipping, taxes, and inventory are right at your fingertips.